If you are in the market for a versatile minivan that easily hauls passengers and loads of all types, consider the 2019 Dodge Grand Caravan at Glenbrook Dodge Chrysler Jeep® in Fort Wayne. Known for its accommodating second- and third-row seating that can be stored in the floor, this mother of all minivans continues to be a popular choice for families. 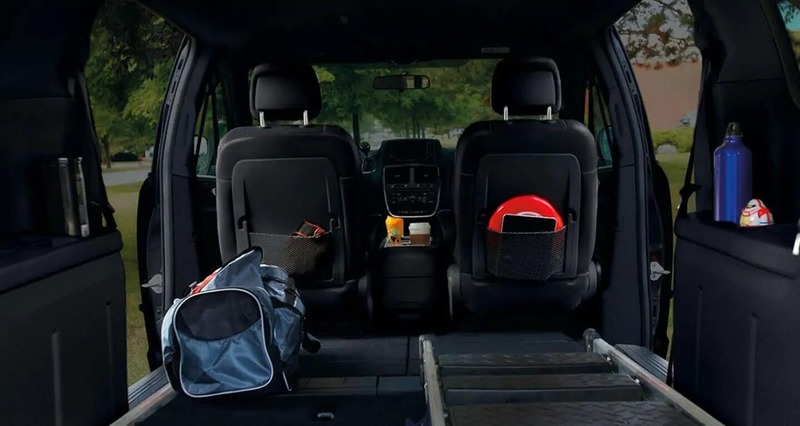 Our Dodge dealers know you need ample space when it comes to traveling with a family, and the 2019 Dodge Grand Caravan delivers with the innovative Stow ‘n Go® seating system. In fact, you can create more than 140 cubic feet with the second- and third-row seats stored in the floor. With all rows in place, you still have 31.1 cubic feet of cargo space. The Stow ‘n Go® third row comes standard, while second-row Stow n’ Go seats are optional in all three trims. Performance wise, a 3.6-liter Pentastar® V6 powers this seven-passenger minivan with 283 horsepower and 260 lb-ft of torque. It even achieves a maximum 25 mpg hwy, which is incredibly impressive for a vehicle this size. All-speed traction control and electronic stability control both come standard. As your trusted Dodge dealers near Auburn, IN, we know families value safety, and the 2019 Dodge Grand Caravan boasts a four-star rating from the National Highway Traffic Safety Administration (NHTSA). Features such as trailer sway damping and the ParkView® rear back up camera are standard equipment, complementing the steel safety frame with seven advanced airbags and front and rear crumple zones. Safety and connectivity go hand-in-hand in the Dodge Grand Caravan. The available Uconnect® system with Bluetooth® wireless and voice command capability offers convenience and helps keep your hands on the wheel. The optional Garmin® navigation system ensures you stay en route and on time to every destination, while SiriusXM® provides every ride with a soundtrack. When you need versatility, convenience, and performance in your family vehicle, talk to our Dodge dealers in Fort Wayne about the 2019 Dodge Grand Caravan. Our Jeep dealership is proud to offer such an extensive selection of vehicles in our new inventory, including the new 2019 Grand Caravan. We are easy to find, right at 100 W Coliseum Blvd. We hope to see you soon for a test drive!